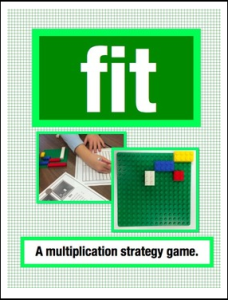 As soon as I introduced this game, fit mania has ensued in my classroom! The students LOVE to play this array game because it makes learning multiplication super fun. In this game the student multiplies the array of each piece they lay down. (Example: a 2 x 4 piece is written on the recording sheet as 2 x 4 = 8.) They can only lay down a piece by connecting corners, which makes it challenging to fit as many pieces as they can. In the end there is a good amount of addition of multiple numbers that is required to determine the winner. There is a challenge mode included where the students multiply the two blocks together (and in some cases three blocks where the corners touch). This is more appropriate for the practice of facts, as well as for multiplying two or more numbers together.